LOS ANGELES (Reuters) - The high-stakes Senate hearing on the nomination of U.S. Supreme Court nominee Brett Kavanaugh riveted American television viewers with roughly 20.4 million people tuning in on six broadcast and cable networks, according to Nielsen data released on Friday. 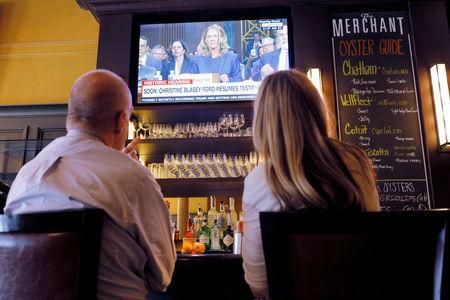 The large number for a weekday audience represents only a fraction of Thursday's total viewership of the emotional testimony that lasted nearly nine hours. It does not include millions more who streamed the event on phones or computers or crowds that watched in bars and other public places. At the hearing before the Senate Judiciary Committee, Stanford University professor Christine Blasey Ford accused Kavanaugh of sexually assaulting her 36 years ago when they were both in high school. Kavanaugh vigorously denied it. Nielsen estimated that 20.4 million people combined watched on broadcast networks ABC, CBS, NBC and cable channels Fox News Channel, CNN and MSNBC. Broadcasters interrupted their regular programming to show the hearing. The total exceeded the audience for the June 2017 hearing where former FBI Director James Comey talked about his dealings with President Trump before he was fired. Roughly 19.5 million people watched that showdown across 10 networks. Walt Disney Co owns ABC. NBC and MSNBC are units of Comcast Corp . Fox News Channel is a division of 21st Century Fox Inc , while AT&T Inc owns CNN and CBS Corp is the parent of CBS. Additional data from other networks is expected to be released on Monday.